The ATTIX 44 dust extractor series sets a new standard for design and feature level of the Nilfisk wet & dry vacuum portfolio. 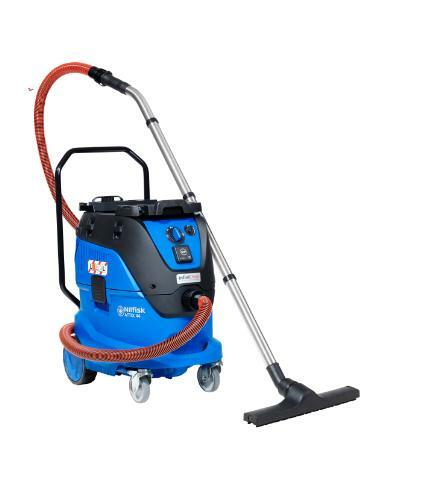 With innovative filtration system, improved performance and robust design, this range represents a superior solution for professional customers looking for a safe and reliable machine with large capacity. ATTIX 44 comes with more suction power, sealed dust system, automatic filter cleaning and several other user benefits - designed to meet the tough requirements in building & constructions and other industries when picking up bigger amounts of dust. ATTIX 44 offers a remarkable productivity thanks to the automatic filter cleaning system InfiniClean™. The InfiniClean™ system ensures continuously cleaning of the filter during operation using a reversed air-flow pulse, keeping suction performance on a high level. The downtime is reduced significantly, as the container can be filled up without filter maintenance – even in the most demanding fine dust applications. Also the washable PTFE long-life filter minimizes maintenance and reduces the overall service cost. Easy handling and user-friendliness - also when it comes to transportation from one working site to another - are other valuable features for the ATTIX 44 dust extractor. All models offer flexible storage solutions for tools and accessories, so everything you need is at hand. Unique dual filter solution available with HEPA filtration. 42 liter container with steel castors and robust bumper.